Summary: When sixteen-year-old Tariq Johnson dies from two gunshot wounds, his community is thrown into an uproar. Tariq was black. The shooter, Jack Franklin, is white. Review: A black boy in a hoodie shot by a white man – sound vaguely familiar? How it Went Down is a book that would work well in a book club or discussion group because it is, unfortunately, very relevant. 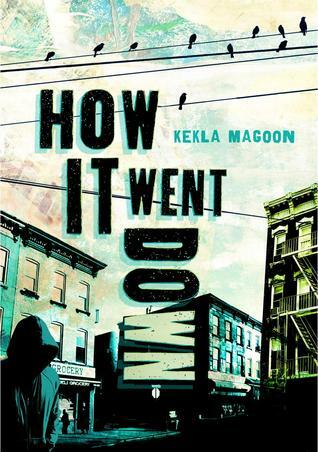 Kekla Magoon tells a story that, while not based on specific people or one event, reflects situations that have occurred in the U.S. in the past few months and years. Fiction is a perfect vehicle for contemplation and discussion of tough subjects. Obviously, race is an issue that is front and center in this book. The dialogues in the book also raise questions about privilege, violence, and responsibility for friends, family and community among other things. The story occurs over a span of nine days and is told through the voices of a wide variety of people. In some ways this makes the book very powerful since there are so many perspectives represented. It also inspires questions. How can there be so many versions of the same incident? How can two people standing right next to each other see something radically different? The various voices reveal actions, motivations, fears, and beliefs that led up to the shooting. These perspectives add a depth to the narrative, but the large number of voices (more than fifteen) make it challenging to distinguish them in the beginning. It’s also more difficult to connect to characters since the voices change often and are usually speaking briefly. Most of the voices are distinct though, so over time, this becomes less of an issue. I especially looked forward to the voice of Tina, Tariq’s little sister. She spoke poetically. Her comments were simplistic, but they were also beautiful. She knew what she knew and trusted her brother implicitly. This wasn’t an easy book to read. There are many moments of pain to be found and experienced. The worst part is that our news headlines contain similar situations. The story seemed all too possible. Recommendation: Buy it now – especially if realistic fiction is your thing. This is a book that shouldn’t be missed. There is much food for thought and the characters are likely to stay with you for a long time.